this past month the weather in toronto has been less then ideal. i swear it has rained almost every single day, or at least it feels that way.. but there is one positive outcome when it won't stop raining, more time to stay inside & bake (& not feel too guilty about staying indoors)! 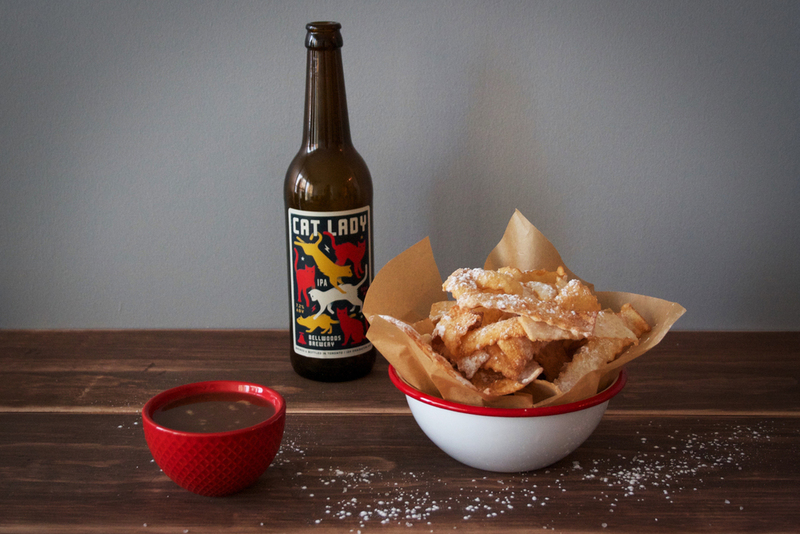 i am not sure what brought me to whip up this concoction of fried wontons and salted caramel sauce. i honestly never deep fry at home because it seems like such a messy process (& unhealthy, i guess). then i got this fried sweet wontons idea in my head and suddenly it all seemed worth it! these are an asian twist to the fried italian pastry i use to eat growing up. i never knew the proper italian term for these fried ribbons & according to google there is like twenty different names: frappe, cioffe, chiacchiere, IDK. lets just stick to calling them fried ribbons k? the wontons produce a lighter and crispier texture, and the caramel dipping sauce honestly taste like a wether's original in liquid form. it makes just over one cup so you will have left over sauce, assuming you don't chug it back (it's pretty addicting, it may happen). i HIGHLY suggest pouring the left overs over your favourite vanilla ice cream as a midnight snack. for the caramel: in a saucepot add the sugar and water. bring it to a boil while wiping down the crystals that form on the sides of the pan using a pastry brush. continue to boil until the mixture turns to a deep amber colour (approximatelyy 5 minutes). be sure not to burn the caramel! it will go from a deep amber to burnt sugar VERY quickly. remove from heat and immediately whisk in the butter and cream. cool to room temperature before serving. for the wontons: using a pastry cutter slice wontons into one inch strips. heat up two inches high of oil in a sauce pot to approximately 350 degrees. the wontons will cook very quickly. fry wontons in small batches and dust when hot with powdered sugar.